Posted on December 2, 2014 by staceyanderton1	in Sports and tagged Clarion Wrestling, Edinboro Wrestling, Saegertown Wrestling. 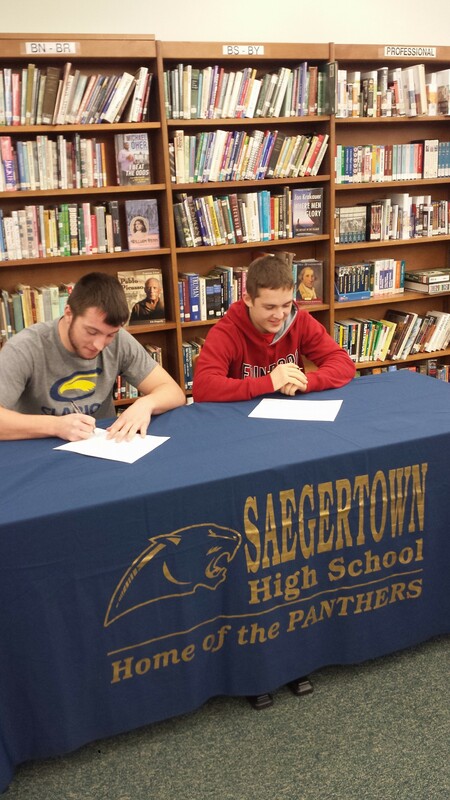 Dylan Reynolds committed to Clarion and Tyler Vath signed with Edinboro on Dec. 2. On Tuesday, December 2, Saegertown seniors Dylan Reynolds and Tyler Vath formally signed commitments to local colleges for wrestling. Reynolds, a two-time state medalist, will be an Eagle at the University of Clarion. “It was an offer I couldn’t pass up, especially because I get to be with my brother,” said Reynolds, whose brother Shawn is a junior at Clarion. Vath, a three-time state medalist, signed to be a Scot at Edinboro University. Vath said he selected Edinboro because the school is D1, close to home, and offers his intended major (health and physical education). Tyler’s father Brett Vath said, “Tyler had been looking at five other schools, and it came as a surprise to me that schools can show up late in the game but still serve as their (the wrestler’s) number one choice in the end.” Both grapplers will receive wrestling scholarships. “It’s awesome to have two boys on a D1 scholarship program, this is the first time we have signed wrestlers to D1 since Pat Bradshaw in 2005. They are both very good wrestlers, and even better kids. This shows that there are scholarships out there, and I believe there will be more hardworking wrestlers to obtain them in the future,” said Saegertown Wrestling head coach Jim Mulligan. Good luck wrestling team of 2015 at Hershey Pa I just want to say I am Proud of you guys for all your hard work. Pay Prayers.